While it’s always great to find a little-known gem before everybody else does, for me the real value in winter menus is to eat great food for less at sought-after restaurant tables. Spots where you can’t easily get a table during high season, where chefs have worked hard to build a reputation. So I was delighted to be invited to sample items from the winter menu at Terroir restaurant at Kleine Zalze estate last week. It’s one of my favourite restaurants for a combination of Michael Broughton’s classically styled food, good service and a casually friendly vibe. On a sunny winter’s day it’s one of the best Winelands venues for an outdoor table with tranquil views. And indoors in chillier weather it immediately ticks the box for having a fireplace. Add red wine and delicious food and it’s a no-brainer. The Terroir Winter Special includes a choice of three starters, three mains, two desserts and a cheese board. Specials are indicated on the chalkboard menu with stars. A plus: the starter options are really creative so you never feel like the specials are substandard to the a la carte options. Rather a more affordable take on a la carte dishes, but offering the flavours and standards Terroir is known for. Highlights of our meal: The Gorgonzola soufflé with poached pear and salted walnuts sounds delicious and would be worth returning to try. 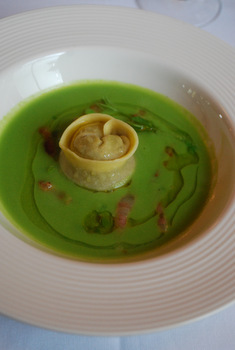 But I was delighted I experienced the oxtail raviolo on celeriac and caramelised onions. Poured around it, a Terroir take on Dutch pea and ham soup - warm, comforting pea soup freshened with petit pois and home-cured bacon bits. Lovely with Kleine Zalze Vineyard Selection Chenin Blanc 2011 too. Less exciting but nevertheless satisfying, a pastry-wrapped square of Norwegian salmon with a Thai curry lentil base could have had more spicy zing. But it worked as a whole, partnered with Kleine Zalze Vineyard Selection Chardonnay 2011. 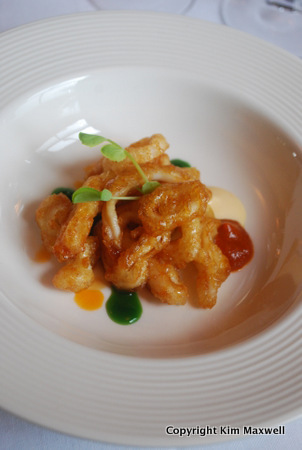 Tempura squid was an outright winner – baby squid in a light tempura batter, livened with a ginger caramel and the Japanese creamy citrus flavours of yuzu mayo and homemade tomato jam. 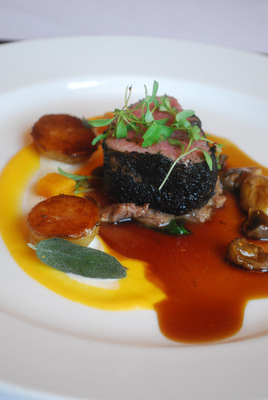 In main courses, a rich beef fillet rolled in mushroom dust had a surprise braised beef rib under the spinach. Butternut puree, Parmesan cream, elegant roast potatoes, mushrooms and a rich jus completed the dish elegantly, and it worked magically with Kleine Zalze Vineyard Selection Shiraz 2009. Other winter special special options were a fish dish on truffled leeks with cep butter and panfried gnocchi, or a creative mushroom risotto with asparagus. Nicely wintry as a dessert, a heavier orange and almond savarin cake topped with banana slices and caramel soaked in lime, vanilla and rum. In contrast, creamy white chocolate ice cream, cherry coulis and crushed pistachios. Cheesecake and apple tart are other desserts that might be served. The menu changes according to seasonal ingredients. Terroir at Kleine Zalze restaurant, Stellenbosch. Terroir Tel 021 880 8167. Well behaved children. Spend: Two courses at R175; three courses at R198. One glass of Kleine Zalze wine is included. Lunch and dinner on Mon to Sat, May until 30 September. The Foodbarn in Noordhoek. Foodbarn. Tel 021 789 1390. Extremely family-friendly. Spend: R175pp for three courses including wine pairings (currently it’s Steenberg) with each course. Four and five-course options also available. Lunch and dinner on Mon to Sat. The Roundhouse, Stans Holt, Camps Bay. Roundhouse Tel 021 4384347. Lunch spend: R220pp for three courses; R400pp incl wine pairings. Lunch Wed to Sunday.